Welcome to "ISHIBASHI of SHIMODA". Please enjoy the fantastic atmosphere of historic Shimoda and a typical Japanese culture. Kurhaus Ishibashi Ryokan is a traditional Japanese-style inn with many hot spring baths, located in Shimoda-a town of South Izu Peninsula. South Izu is famous for its beautiful beaches, great nature and fresh seafood. 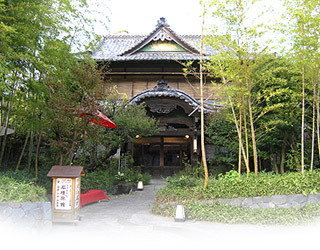 Our ryokan has 10 different types of Onsen(natural hot spring bath)to relax. We are 7min by car from Izukyu-Shimoda Station, Izu-kyuko Line. We provide you with many ways to relax and shape up with our variety of featured baths. 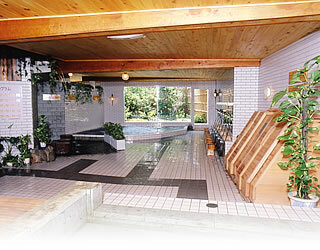 Try our onsen with cascading water and sauna with steam from our hot spring. 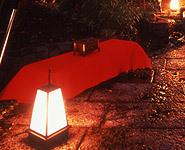 Also, our roten-buro(outdoor bath)in the garden refreshes your body. Shirahama, Sotoura, Toji etc…lovely coastline. 9different bathing resorts where you can enjoy surfing, snorkeling, and so on are all waiting your visit. Relaxing places like pure hot spring baths are always you will find yourself relaxed and refreshed during your stay in this small and quiet town. Blessed with its rich hot spring baths, there's excited mountain and ocean scenery and mild climate throughout year, Shimoda is the biggest tourist resort in southern Izu attracting many visitors there. Guest rooms are Japanese-style and we also have Western. All rooms are en-suite. Guest can enjoy our ballroom and lounge, as well as availing of parking lots, gymnasium, and tea-ceremony room. Check-in is from 3PM and check-out is 10AM. Usually, in charges at Ryokan include breakfast and dinner. However, we prepare charge for the room for a guest. It's 8,640Yen for one night per person. If you make this choice, please contuct us by telephone. Meals can be ordered separately. Breakfast(2,160Yen〜) - order when you check-in. Dinner(5,400Yen〜) - order by e-mail once you confirmed your booking. Both meals are Japanese-style. Children who do not use futon are charged 1,620Yen one person per night. Also 150Yen of bathing tax applied. Children at 6years old or above are charged the same rate as adults. We accept all payments by credit cards. There are separate baths for men and women. There is also a bubble bath, jet bath, onsen(hot spring bath)with cascading water, roten-buro(outdoor-bath), relaxing area, aqua therapy, aroma therapy as well as promenade. Espacially, hot spring of Kurhaus Ishibashi is excellent. Copyright©2005 KURHAUS-ISHIBASHI. All Rights Reserved.